So the COOLEST thing just happened! 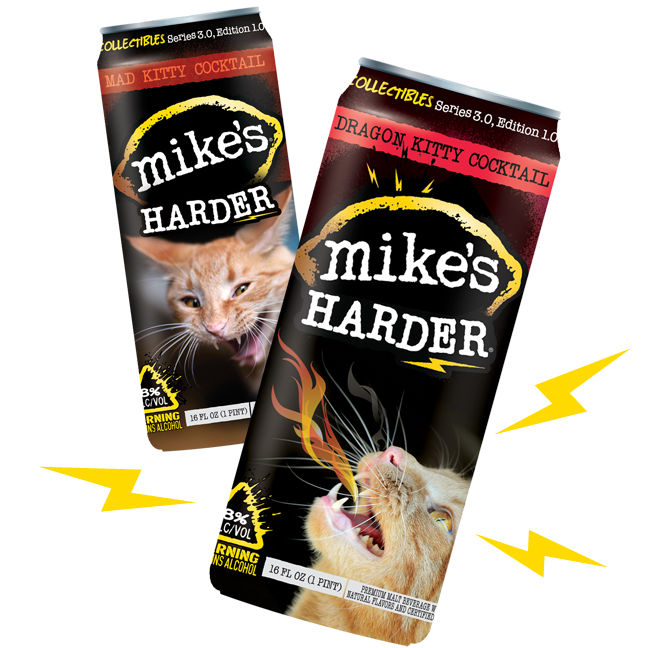 What could possibly be AS COOL as seeing ME on the new mike's® HARDER Mad Kitty Cocktail cans this fall??? Seeing me AGAIN on a new mike's® HARDER Dragon Kitty Cocktail can next spring!!! Me and Glogirly just entered our design in their latest contest for a new Dragonfruit Flavored Mike's and we're SO excited about it! I had a special photo shoot for it and everything. Don't I look all dragon-y??? We think that a big part of the reason mike's® chose our winning Mad Kitty Cocktail design was because of all the social buzz YOU helped create. Ok, and because I look awesomely fierce and handsome. But did you know that our first can design had more comments than any of the other 217 can designs in the contest??? And if you can believe it...a few of those comments weren't very nice. As hard as it is for me to believe, I don't think many of the other artists have or even LIKE cats. Or maybe they're allergic. No wonder, because some of them think my name is Sniffles! SNIFFLES? What kind of name is THAT??? Official voting hasn't started yet, but we want to get the buzz going NOW. So please visit my Dragon Kitty Cocktail Page and leave Glogirly and mike's® HARDER some kitty LOVE in the comments! We'll be sure to keep you posted on the contest and let you know when the official voting starts. 1. Just click the link above and login either with Facebook or your email. Thank you from the bottom of my DRAGON KITTY heart! I must be doing something wrong because it takes me to Bit.ly and once I log in it tells me what I have commented on. Meowzers Waffles! I hope that you don't REALLY have dragon fire breath! Otherwise Katie is in trouble. The dragonfruit drink sounds tastier to me, so I hope you win! Anything for you my Waffles. We fixed the link and everything is working now. Right. Anyway, you'll need the mad bucks to support Katie in the style your ladylove deserves, so we hope Mike's does a whole Harder Waffles series!! Do you know, my human was ALREADY logged in! So leaving a comment only took her one step! Go Waffles! Yay, Waffles!!! Sniffles?!? 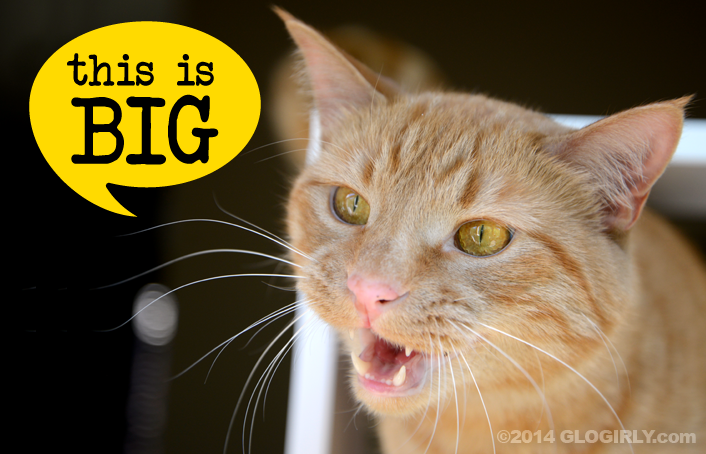 That's a TERRIBLE name fur a cat, especially such a fierce one like you!!! Waffles, if that's really your breath, be kind to Katie and have a breath mint. Ladycats like that. Waffles, we hope you don't breathe on Katie. She'll be toast! We love the new can design! That really is very cool and we will go see if we can figure out where to comment! Sniffles?? sheesh.... some people just aren't smart enough to realize the marketing potential for cats. so there! we can't wait to vote - we think you make an awesome dragon! I will be sure to vote on that can design, when the time comes. I think it pawsome. Shared shared and shared!!! I love the dragon look Waffles! I went over to leave you some comment love at Mikes as well! Good luck buddy! Waffles...I cannot imagine you will have any competition because your design ROCKS! I'm definitely voting for you! Now this is one epic pic! Waffles you had an excellent photo shoot and we think this design is pawsome! Nice cans! (hee hee). Now I really want a cocktail, and it's not even 10 am. I love it! I left a comment. Pawsum fotos Waffles and good luck. Whew. Well, we had to get creative, but I think we voted. We left a comment, in any case. That is the most pawsome image ever!! I so want to see it win. Sniffles … heh. Yeah! This is awesome, Waffles! We will go and check things out now, and see if we can comment! We hope you win this Waffles cuz there wouldn't be any other advertising as cute as you pal. 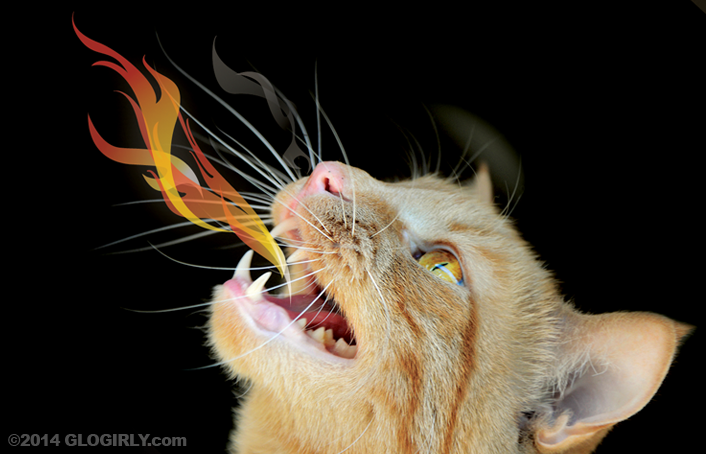 Watch out Katie - Waffles has dragon fire breath! Waffles..What a pawsome dragon kitty you are..does Glogirly know you can do that..you got my vote little buddy..
Hey Waffles, We just left you a comment a Zoopa. Let us know when the voting starts. We'll be there for you. XO, Lily Olivia, Mauricio, Misty May, Giulietta, Fiona, Astrid, Lisbeth and Calista Jo p.s. Sniffles? How rude! I left a comment Waffles, but please don't breathe on me. We have gone to the page to support Waffles and have asked our friends to vote too! You totally have my vote, Waffles! I love Mike's, and I really love the idea of a Mike's can with your gorgeous self on it.